In this article I’ll talk about podcasting hosting and the different podcast hosts I recommend to podcasters. This article is about audio file hosting, not hosting as in sitting behind a microphone hosting – 🙂 Although I’ve got some good info on that here). 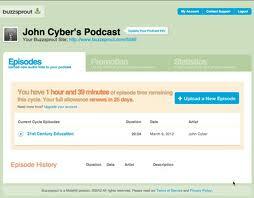 Podcast hosting refers to the online base of your podcast episodes. So in basic terms, where your audio is stored. Why pay for a host? – Because size does really matter…. Lot’s of people think that they can use a regular web host to host their podcast, but this is a bad idea because the average size of a podcast episode is considerably more than a basic web page. This means you’d be chewing through a lot more storage space and bandwidth once you start getting an audience who want to download your episodes. This is why most podcasters use a dedicated podcast host to store their audio. To give you an example, a 30-minute podcast that’s fairly compressed with have a size of about 15MB. So if you can imagine a hundred or so people downloading that episode then all of a sudden you are consuming quite a bit of bandwidth, which is going to be quite expensive on a regular website host. I want to use a podcast interface that is streamlined and not clunky. There’s a few podcast hosts out there that make you jump through a bunch of hoops just to get an episode published. These days most of the paid podcast hosts provide comprehensive statistics of your podcast. This means at ANY time I can login and see where my listening audience is from, what machine they are listening to me on and what episodes they liked best! This type of information is crucial if you are trying to build out your audience because you can target content to your audience better and have a strong sense of what episodes they loved and what they didn’t. I use WordPress to build all my podcast websites and so it’s very important to me to use a podcast host that has a plugin that works well with WordPress. For me using a plugin makes the whole process of publishing an episode on my blog a walk in the park and a process that only takes about 2 minutes. Buzzsprout offers a very basic statistic service, but their interface is very easy for newbies. I get up to 4 hours of podcast hours a month included in my basic plan and they have an excellent plug-in that works seamlessly with my WordPress blog. This means from uploading to publishing on my blog is about a 5 – 10 minute process! Buzzsprout also generate a code that I just have to drop into the iTunes store and my podcast will be available in iTunes. If you want EASE then Buzzsprout is great! But what makes up for their lack of plugin is the fact that with Libsyn if you jump to a higher plan they’ll help you create an app for your podcast! When your deciding the best podcasting hosting to go with think about how often you’ll release episodes, how big they’ll be and what the size of your audience will be. Leave room for growth because a podcast is a slow burning medium, it takes a while to get going but once it does you’ll have a rip roaring fire! 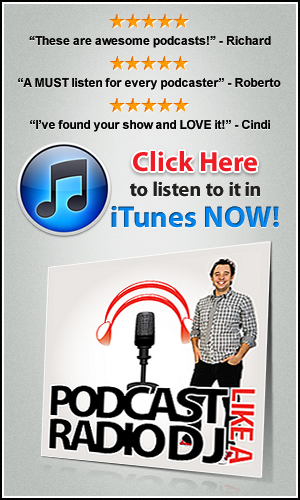 The best podcasting hosting services I’ve recommended are used by thousands of podcasters and do the job very well. They also have excellent support so if you have any questions or concerns their support teams will be more than willing to help you. I hope that’s cleared up some things about podcasting hosting for you!